If I could choose my last meal on earth, Benihana’s fried rice would at least be the appetizer. I don’t know why it’s leaps and bounds better than all other fried rice, but it is. Their ginger sauce is supposed to be for the seafood and veggies, but I use it on everything, including the rice. I’ve attempted fried rice before, but this was the first time I tried to make it exactly like theirs. I had no idea I could find the recipe for their ginger sauce online, but when I did, I knew I had to make that too. 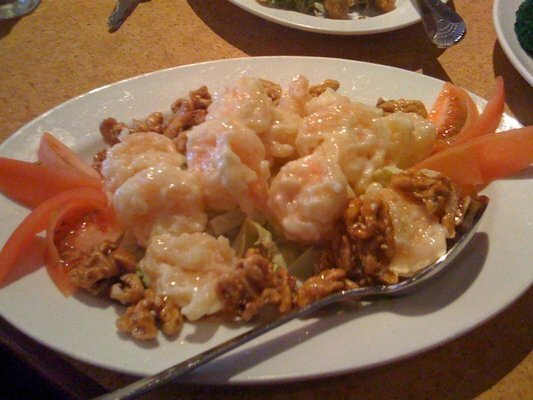 Yan’s is one of my favorite Chinese places, and I can’t go there without ordering the honey walnut prawn. It’s like candy. My mom and brother, Mason, were nice enough to be my guinea pig taste testers (Mason even helped me make the rice and chop everything). We all agreed that this was one of the most successful meals I’ve ever made. Not the most complicated or difficult, but no joke, OMG, like WOW! Everything was soooo good. The honey walnut prawns were sweeter than Yan’s, but still very tasty. The fried rice was good too, but what really made it great was the ginger sauce. I swear I wasn’t expecting it to come out so… what’s the right word? PERFECT. Nothing I ever make is perfect, but it looked, smelled, and tasted exactly like the Benihana’s. Mason said he was sad to know that we’ve wasted so much of our lives not making this sauce, and I agree.